Digerati and 3D Avenue have revealed that Spectrum, a platformer previously released on Steam, will be making its way to Nintendo Switch this spring. 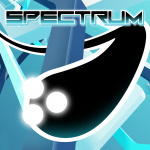 Spectrum takes away the regular platforming restrictions of only running along the ground, replacing it with a gravity-defying challenge full of bright and bold scenery. Players must jump, dive, and find their flow to skilfully navigate their way through 80 levels of shifting shapes, avoiding getting trapped and squashed along the way. No exact release date or pricing has been confirmed as of yet, although we have been assured that these details will be released in due course. Do like the abstract aesthetic...but what exactly are you playing as? Ehh, you are flying so it isn't a platformer!